National Highway 8 (NH 8) connects New Delhi and Mumbai. The 1,375 km route is probably the most traveled road of the entire Indian subcontinent. In addition to cars, buses, motorcycles, donkey carts and pedestrians, the partially four-lane highway is a major truck route. 65% of all load transport in India is road based and an immense number of lorries move on this expressway, day and night. The trucks are mostly Indian manufactured and are handed over to their future owners as simple chassis. Cabins, loading platforms and other structures are custom built. The cabin is often a wooden construction with the interiors laid out with a large flat rack which serves as seat, bed or table as required. Trucks achieve an average speed of less than 35km/h so transport distances of thousands of kilometers require a correspondingly long time. A truck crew is often on the road more than a week and the three man live out of the truck cabin for the duration. Food ingredients are carried along and then cooked and eaten on the roadside. The crew take turns sleeping. The crew of such trucks usually consists of three people: the Driver, the Assistant Driver, and a young man, the Cleaner, who is responsible for the cleanliness of the cabin and the general welfare of the others. On the long and dangerous night trips, the cleaner serves as an additional pair of attentive eyes on the lookout for obstacles, breakdowns, wandering animals and pedestrians. India averages 18 annual road fatalities per 100,000 inhabitants and sadly is in the leading group of developing countries in terms of number of traffic accidents. In the year 2011 alone 150,000 people died on the road. This figure is even more shocking considering the relatively low number of vehicles and of kilometers traveled in relation to the population. Prof. Peter Kabel – b.1962 Germany, studied Visual Communication and Philosophy in Hamburg. After studying Visual Communications and Philosophy in Hamburg, Peter Kabel worked for many years as editorial designer for various international and German magazines and newspapers. He founded companies like Trend Büro and Büro Hamburg, as well as the consulting firm for digital media Kabel New Media. Besides his work as a media entrepreneur Peter has consulted for brands such as Time Warner, BMW, Deutsche Bank and Siemens. In 1996, Peter became a Professor at the University of Applied Sciences in Hamburg in Communication Design. Peter is an alert observer and avid photographer. He has contributed to a number of books and magazines and published numerous articles. Peter’s relationship with India began with a long-term stay in 2002. He lives in Hamburg, Germany between trips to India. 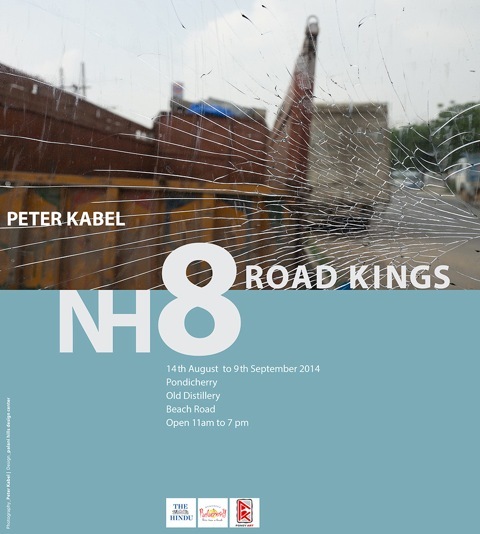 The presented work, NH8 Road Kings was produced in and around Gurgaon in the autumn of 2013.